Reason for being involved in workshop: I want to help get more underrepresented groups represented in conference presentations. As a trans-woman there is very few people who I identify with presenting currently. I want everyone to be able to see themselves in that role! 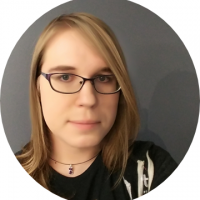 About Erin: A Denver based transgender pythonista and devopsy developer. I currently work at Ibotta. There is attached parking Accessible from Stout St.
You will need to come around to the 18th and California side of the building where we will have someone to let you in. We will badge you up to our space and have you sign in per the building's requirements. There is a conference room to the side of the area that we will be using as a quiet room. We have a privacy room for nursing on the floor the workshop will be on. There is a ramp to the main door we are letting everyone into and elevators up to the venue. We have chairs with and without arms. This is an office, and we will not be having alcohol on site.